Johann Friedrich Wilhelm Adolf von Baeyer (October 31, 1835 – August 20, 1917) was a German chemist who made major contributions to the field of organic chemistry and was awarded the 1905 Nobel Prize in Chemistry. His main accomplishments included synthesis of the plant dye indigo, discovery of the phthalein dyes, and discovery of barbituric acid, the base for the class of sedatives known as barbiturates. He also investigated polyacetylenes, oxonium salts, nitroso compounds, and uric acid derivatives. He experimented with a synthetic resin, almost preempting Leo Baekeland's later discovery of Bakelite. In theoretical chemistry, he formulated the "strain" (Spannung) theory of triple bonds and the strain theory for small carbon rings. 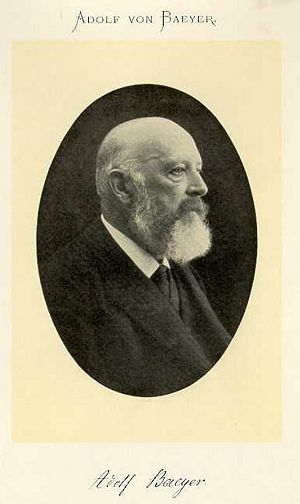 Baeyer was born on October 31, 1835, in Berlin, the son of Johann Jakob Baeyer and Eugenie née Hitzig. He came from a family distinguished both in literature and the natural sciences. His father, a lieutenant-general, was the originator of the European system of geodetic measurement, and worked with the astronomer Friedrich Wilhelm Bessel on a project to determine the shape of the earth. His mother converted to Christianity from Judaism and came from a family with a strong record of public service and achievement. Even as a child Baeyer was interested in chemical experiments and at the age of 12 found a new double salt of copper. He spent his middle school years at the Friedrich-Wilhelms Gymnasium. Baeyer devoted his first two years as a student at the University of Berlin (1853-1855) chiefly to physics and mathematics. By 1856, however, his old love for chemistry re-awakened and drew him to Robert Bunsen's laboratory at the University of Heidelberg. His studies there on methyl chloride resulted in his first published work in 1857. The following year he worked in the laboratory of Friedrich August Kekulé in Heidelberg and was associated with his ingenious theories of chemical structure. Baeyer's life work was soon to bring this indeed most brilliant of chemical theories much resounding success. In 1858, he received his doctorate from the University of Berlin for his work on cacodyl compounds which he completed while working in Kekulé's laboratory. For the next year or two Baeyer was again working with Kekulé who had meanwhile become professor at Ghent. A study of uric acid, which also led him to the discovery of barbituric acid, provided the thesis by which he qualified as a university teacher in 1860. In the same year he became a lecturer in organic chemistry at the "Gewerbe-Akademie" (Trade Academy) in Berlin. He received little money but was given a spacious laboratory. In 1866 the University of Berlin, at the suggestion of A. W. Hofmann, conferred on him a senior lectureship, which, however, was unpaid. It was during the Berlin period that Baeyer began most of the work that was to bring him fame later. In 1865 he started his work on indigo, the natural blue dye that had fascinated him since his youth, and this soon led to the discovery of indole, a naturally occurring organic compound, and to the partial synthesis of indigotin. His pupils Carl Graebe and Carl Liebermann, with the help of the zinc-dust distillation developed by Baeyer, clarified the structure of alizarin, an orange red dye, and worked out the synthesis used industrially. Studies were initiated on condensation reactions which, after Baeyer had gone to the newly established University of Strassburg as Professor in 1872, brought to light that important category of dyes, the phthaleins. Baeyer's theory of carbon-dioxide assimilation in formaldehyde also belongs to this period. On the death of Justus von Liebig in 1873, Baeyer was called to his chair at the University of Munich and there, over many years, built up an excellent new chemical laboratory. With his tenure at Munich came elegant total syntheses of indigo, as well as work on acetylene and polyacetylene, and from this derived the famous Baeyer strain theory of the carbon rings, which explained why most carbon rings consist of five or six carbon atoms. He also studied of the constitution of benzene and initiated comprehensive investigations into cyclic terpene. Especial interest was aroused theoretically by his work on organic peroxides and oxonium compounds and on the connection between constitution and color. In 1880, he developed a method for the synthesis of indigo, and was awarded the Davy Medal of the Royal Academy of London a year later. In 1883, Von Baeyer worked out indigo's chemical structure. Baeyer also investigated the resin formed from the reaction between phenol and formaldehyde. This resin would later be the material Leo Hendrick Baekeland used to synthesize Bakelite, one of the first plastics. Baeyer's work was at once pioneering and many-sided. With admirable penetration and extraordinary experimental skill he combined dogged perseverance and, even at 70 years old, a youthful buoyancy in his work. He was careful never to overestimate the value of a theory. While Kekulé sometimes approached Nature with preconceived opinions, Baeyer would say: "I have never set up an experiment to see whether I was right, but to see how the materials behave." Even in old age his views did not become fixed, and his mind remained open to new developments in chemical science. Like Berzelius and Liebig, Baeyer distinguished himself by forming a school which alone nurtured fifty future university teachers. Among his students were numerous chemists who made a mark in their field, including Friedrich K.J. Thiele, F. Schlenk, Heinrich Otto Wieland, Kurt Meyer, Emil Fischer and Otto Fischer. Honors were heaped upon him, including the Nobel Prize in Chemistry in 1905 for his advancement of organic chemistry and the chemical industry, and for his work on dyes and hydroaromatic compounds. On his fiftieth birthday, he was raised to the hereditary nobility. Baeyer married Adelheid (Lida) Bendemann in 1868. They had one daughter, who became the wife of the chemist Oskar Piloty, and two sons, both university lecturers, Hans in medicine at Munich, and Otto in physics at Berlin. He was still young in spirit when he succumbed to a seizure at his country house at Starnberger See on August 20, 1917. Baeyer's chief achievements include the synthesis and description of the plant dye indigo, the discovery of the phthalein dyes, and the investigation of polyacetylenes, oxonium salts, nitroso compounds (1869) and uric acid derivatives (1860 and onwards) (including the discovery of barbituric acid (1864), the parent compound of the barbiturates). He was the first to propose the correct formula for indole in 1869, after publishing the first synthesis three years earlier. His contributions to theoretical chemistry include the 'strain' (Spannung) theory of triple bonds and strain theory in small carbon rings. Partington, J. R. 1964. A History of Chemistry, vol. 4. New York: Macmillan. pp. 775-788. Von Meyer, Ernst. 1906. A History of Chemistry, translated by George McGowan. New York: The Macmillan Company. History of "Adolf von Baeyer"
This page was last modified on 12 February 2016, at 15:29.